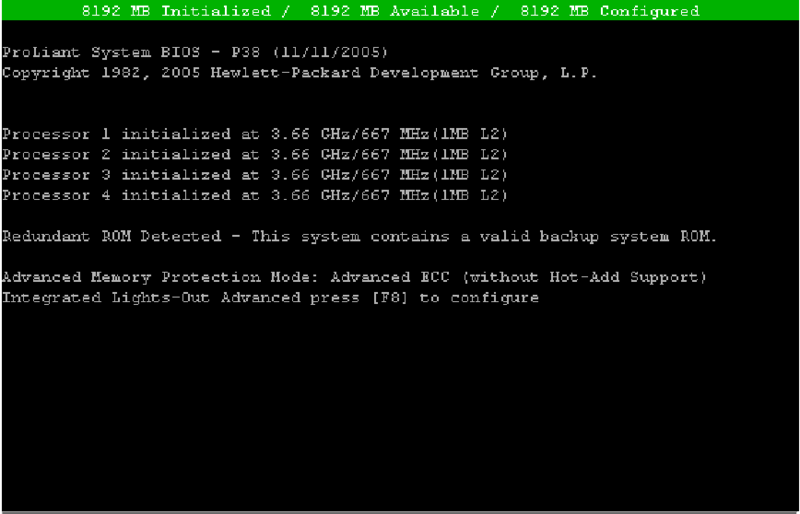 In an HP Proliant DL380 G3 I had an older iLO. The ROM-based setup utility F8 (RBSU F8) allows you to configure RILOE II during server boot-up. RBSU F8 is useful for configuring servers that do not use DNS/DHCP. RBSU F8 is available every time the server is booted. RBSU F8 cannot run remotely. Select the appropriate Linux operating system. Select Software – Lights-Out Management category. 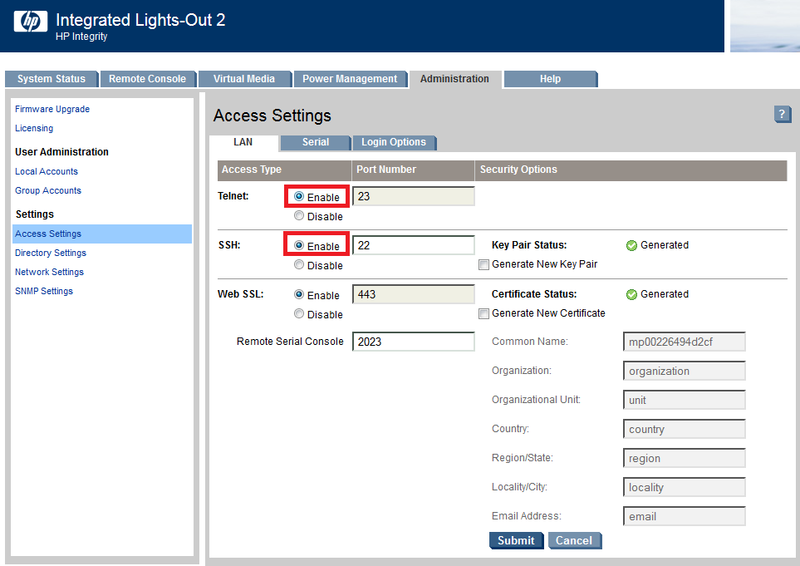 Select the HP Lights-Out Online Configuration Utility for Linux . Select the appropriate version of the HP Lights-Out Online Configuration Utility and click the “download” button. After installing, run as shown below. Sorry, LAN Console access is currently disabled. Connection to 10.0.0.120 closed by foreign host. You need to enable telnet and/or ssh according to the picture below. Access using a browser on the same IP address of the MP. help : Used to get context sensitive help. show : Used to show values of a property or contents of a collection target. create : Used to create new user account in the name space of the MAP. delete : Used to delete user account in the name space of the MAP. set : Used to set a property or set of properties to a specific value. start : Used to cause a target to change state to a higher run level. stop : Used to cause a target to change state to a lower run level. cd : Used to set the current default target. exit : Used to terminate the CLP session. 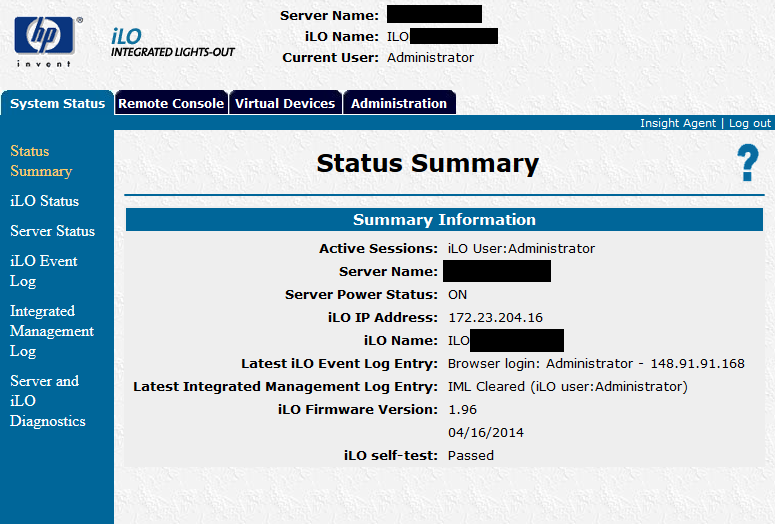 oemhp_ping : Used to determine if an IP address is reachable from this iLO 2. POWER : Control server power. UID : Control Unit-ID light. NMI : Generate an NMI. VM : Virtual media commands. VSP : Invoke virtual serial port. Type VSP and you’re in. To login as root you need to include the serial port (in this case ttyS1) on your /etc/securetty file or you will be given the error message that your user or password is wrong.